One of the wonderful things about being part of Saybrook’s community is the opportunity to connect with and continue to learn from the faculty teaching in the different schools and programs. 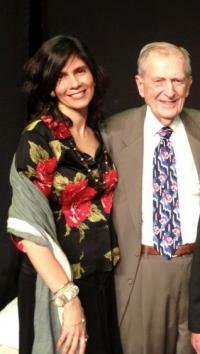 Ever since I was enrolled as a student in the late 1990s, I have been an admirer of the profound scholarship, intellectual brilliance, and refreshing humility of Stanley Krippner. Even though he was not my professor, except for a couple of seminars during residential conferences, I have always considered him my mentor. He has been an ongoing inspiration and supporter of my personal and professional evolution. Stan is a transcultural being. He has the ability to connect with humanity in all its diversity. In my relationship with him, he has always reached out to meet me in my Mexican womanhood while treating me as his friend and equal human fellow. Stan has been collaborating for several years with the Transpersonal Institute in Puebla, Mexico. Stan serves on their board and goes frequently to teach in Puebla. For the past year or so, this university has been organizing a congress on science and spirituality and Stan reached out to me to see if I had any recommendations of possible speakers. I took a couple of days to respond and was able to provide him with a couple of names. Next thing I knew, I was invited to present at the congress. When I saw the roster of the other 14 speakers, I had one clear reaction: I didn’t belong. It was a combination of feeling insufficient and stretched beyond my scope. I am very interested in the intersection of science and spirituality but that’s not the main focus of my work. And I just don’t have the level of accomplishment of the other “brilliant minds” (as the publicity for the event stated). But I knew perfectly what Stan was doing: nudging me gently to take a (bold) step beyond my current comfort zone. He has fully stepped into his role as an elder and, as such, he is a true supporter of younger generations. He believed I had something to contribute so I decided to listen and explore what that could be. After saying yes to the invitation to the event, it was evident that I was saying yes to a larger inquiry. The universe eagerly started to send me learning opportunities to grow into this new direction. This became apparent as I was preparing my presentation. I submitted my abstract more than seven months ago. The title was “Systems Science and Spirituality: Connecting Mind, Heart and Spirit for Healing Ourselves and Transforming the World.” As I was preparing my presentation, I was pleasantly surprised to notice how many of my experiences since then have been lessons on a topic that at the time felt more like an intention. My experience in the dialogue on recovering the soul of place at Wasan Island, my most recent experiences teaching at Saybrook, and my learning and experimentation with the Global Leadership Lab are a few examples. They have been spaces that have allowed me to experience a deeper way of being human: opportunities to experience healing and wholeness and the reintegration of the sacred in work and life. As I listened to the talks of some of my co-presenters, I found myself sitting at the edge of my seat. In particular, the presentations by Dr. Allan Combs, Rabbi Olivier Benham, and Dr. Amit Goswami where full of ideas that explained “the other side of my work”: the side that supports, grounds, and validates my approach to organizational systems. I am a scholar-practitioner, and my work has been to bridge the knowledge from academia with the practical needs of organizations and communities to address socio-ecological realities. My contribution is the translation of ideas into practices. And my current passion is creating the containers, the safe spaces, where people can experience and emotionally connect to the mind blowing findings from the new sciences—from quantum physics to consciousness research. I am interested in the creation of the “fields of resonance” where people can learn and experience collaboration and synergy to accelerate the emergence of ecosystems of social innovations. Public speaking always makes me nervous even when I’m in an intimate circle with collaborators. But there I was, on a stage, facing an audience of almost 2,000 people. I wasn’t too happy about my own presentation. The feeling of not being good enough didn’t go away. The inner critic that prevents us from giving freely our gifts is tough and persistent. I forgot to say a few things that I had planned to say and it took me a while to get into the flow of my narrative. But in the middle of my presentation, feeling a little bit more relaxed, I became aware (again) that my sincere intention to serve, to be a midwife of the new world that wants to be born, is probably more important than my words. My main message was around my current work that seeks to integrate being into doing. I am exploring the practical implications of transdisciplinarity: what ways of knowing, from the vast spectrum of human experience, have been excluded from science—and as a result, from business and culture—as the supremacy of rationality and objectivity was established? I am interested in re-membering (or re-connecting) the wisdom from the body, from the spiritual world, from nature. I want the voices of women, youth, children, indigenous peoples, ancestors and future generations of all species, to be heard, respected, and included in the decision-making processes and integrated in the design of solutions for our societal problems. I want the arts and humanities to be considered essential forms of inquiry; not tangential and optional forms of human expression, but core practices to heal and become whole humans. I want us to go back to our human origins when we knew—if only intuitively—that we are part of something much larger, participants in a sacred dance of being and becoming. During the break after my presentation, as I was trying to go and get coffee from the lobby, I was stopped by people in the audience who wanted to ask me more questions or express their appreciation. Knowing that I touched the heart of at least a few people in the audience and inspired them to embrace their search for purpose and service made this trip worthy. Some years ago, Stan called me an “organizational shaman.” I never forgot it but, at the time, I didn’t know what to do with that. A common dictionary definition says that a shaman is someone “who uses magic for the purpose of curing the sick, divining the hidden, and controlling events.” I once heard a presentation by Claire Zammit and Katherine Woodward Thomas where they defined feminine power as the magic to create what our heart longs for. Feminine energy is nurturing, supportive, and created through relating and connecting. “Magic” is another word for the emergence of possibilities from this relational field. “Health” shares the same etymological root as “whole” and “holy.” And one of the most potent insights of my work as a consultant is the acknowledgement that paying attention to the “invisible”—the consciousness and intentions of people, their values and cares, and the emotional network of relationships—can make a difference in producing the results we want. Those invisible dimensions are the topic of the exploration in the convergence of scientific and spiritual inquiry. So an organizational shaman can be seen as someone who creates the conditions for deeper connections—intellectual, emotional, physical, spiritual—that enable creative and emergent processes to bring back wholeness and facilitating the actualization of the organizational purpose as it contributes to the healing and transformation of our world. I think I am ready embrace that. Thank you Stan for gently nudge me in this direction. I love you.